While the amount of time your child spends reading can be important to his/her literacy, the quality of this reading is even more important. How well your child comprehends what he is reading is not only a good indicator of his reading level, but his understanding of more complex topics, themes and facts as well. As a parent there is much that you can do to check your child's reading comprehension: asking children to predict what will happen next; answer questions at the end of specific sections; research unfamiliar vocabulary words; draw connections between two or more stories or draw connections between a story and real life. Predicting what will happen next is a great way to check a child's reading comprehension because predictions will only make sense if a child understands what has already happened. You can ask your child to start making these predictions before you even open a book. Look at the front cover together and ask what she sees and what she thinks will happen in the story based on the cover. Cover art can also give hints about the type of writing found within, particularly the genre, which can be a good discussion starter with older readers as well. If you and your child read together, use the end of a page, scene or chapter to ask her what she thinks will happen next. If your child Reads Independently, when he is finished reading for the day ask him to summarise what has happened so far and what he thinks will happen next and why. If he is able to provide logical reasons based on what has already been read then chances are he has understood what he has been reading. Having your child answer questions about what they have read may seem a bit like a formal reading test, but it doesn't have to be. Again, if you read with your child then use a logical cut-off point like the end of a scene or chapter to ask your child what has just happened. If it helps, pretend you were confused by the story and need your child's help to sort it out. If your child reads independently then you will need to pre-read the book (or look up the plot online) and have a few questions ready for each section of the story. These questions could pertain to the setting, the characters and their motivations or an issue or theme. You might also ask for your child's opinion on an action taken in the story, or ask your child to explain a cause and effect relationship involving this action. Don't forget to ask your child if he is enjoying the story too, and to explain why or why not. The answers your child provides for these questions will help you track the sophistication of his or her understanding as well as his emerging literary tastes. 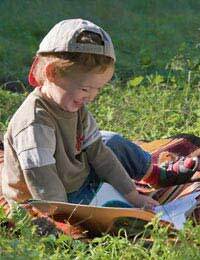 Some of what a child reads should be slightly challenging, so that the child is always stretching literary muscles. Vocabulary can challenge children, so teach your child to keep a dictionary nearby and how to look up new words. If possible, present your child with her own children's dictionary for just this task. If you read with your child, make a list of unfamiliar words as you go and then stop at a logical point such as the end of a sentence or paragraph to look up the word and make sure that your child understands what it means in context. If your child reads independently, ask her to make a list of the words she looked up while reading and discuss them together at the end of each reading session. Your child may begin to feel like this research is a bit like extra homework, so providing little treats or prizes for looking up an unfamiliar word and explaining what it means in the story could be one way of making it more fun. Even when children understand everything they read in a story they may not necessarily see what the story has to do with their own life. Help your child draw connections between what they read and how they live by asking pointed questions. For example, while reading a historical fiction you might ask your child why he thinks the characters dressed a certain way or ate certain foods, and why he thinks that you don't dress or eat like that today. Similarly, stories featuring children in different countries could be the starting point for a discussion of cultural diversity and stories featuring celebrations or religious holidays could help start discussions about your own traditions and beliefs. Children may see these connections themselves and ask you the questions as they read, so be prepared to answer at any time! Checking your child's reading comprehension is an integral part of ensuring that your child is reading at an appropriate level and progressing at an appropriate pace. Predicting what will happen next, answering questions as he reads, researching unfamiliar vocabulary words and drawing connections between what they are reading and their own lives are all methods by which children can show their reading comprehension.